I love nibbling on a few good dark chocolate squares after dinner as much as the next person. But, sometimes, I just feel like something a little more. Something with more oomph; more protein; more nutrients and more…pretty pizazz (insert jazz hands here). These raw chocolate brownie bites are that. 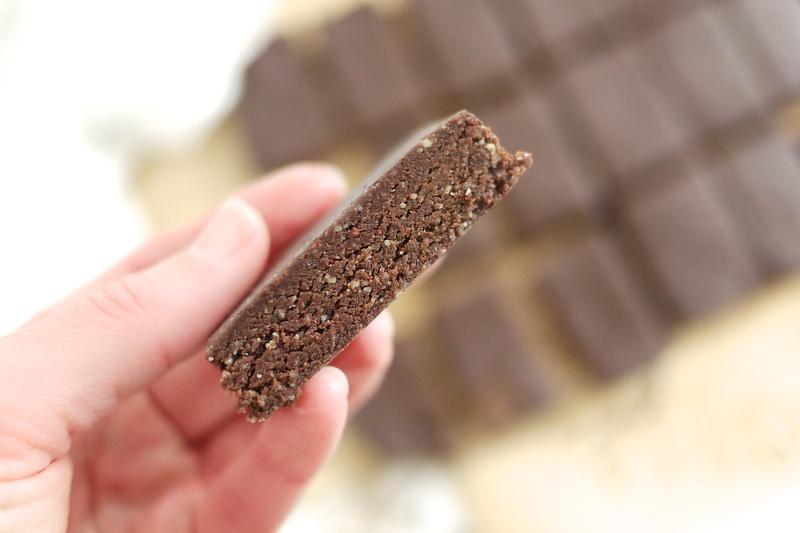 Not only do they hit the spot for a killer chocolate craving, they also do the trick as a blood sugar balancing snack through the day, before a workout or as a healthy dinner-party dessert. Because they’re raw, they’re quick! 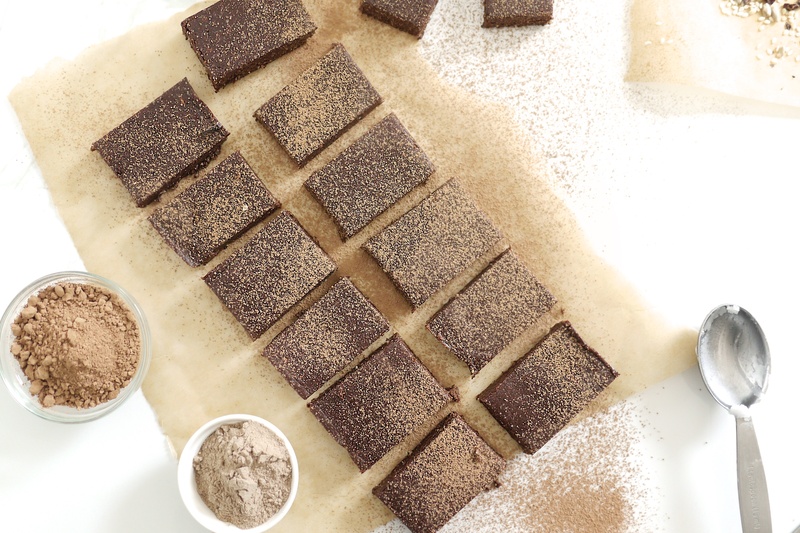 These brownie bites, literally, come together with the help of a quick whiz in the food processor and a firm press of the fingers before heading to the freezer to chillax for a bit. That’s pretty much it. You’ll love that they are gluten-free, dairy-free, and refined sugar free, aaand totally nut-free too. 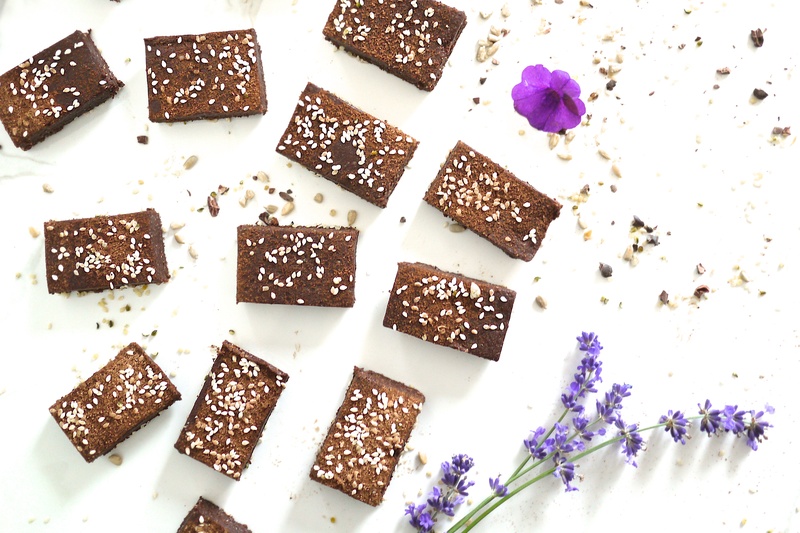 This is kind of a big deal for a raw dessert as most recipes use nuts in place of flour which can make them limiting for people with allergies or to pack in your kid’s lunchbox. Not so with these little goodies! 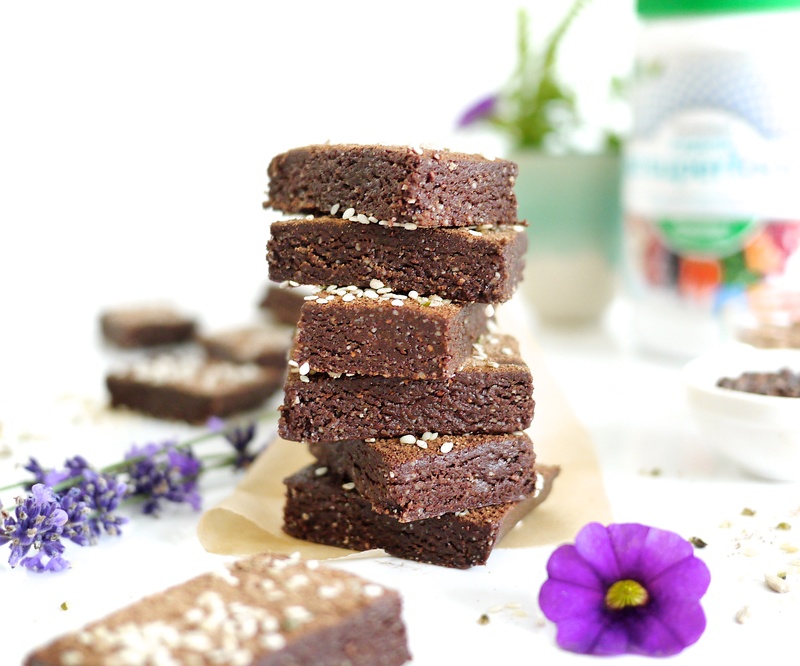 I just used a variety of super-nutritious raw seeds like sunflower, sesame and hemp instead. So, they’re still full of protein, healthy fats (including Omega 3s) and minerals like calcium, magnesium and zinc. I took the opportunity to add even more superfood goodness by way of Genuine Health’s new fermented organic gut superfoods. I’m loving this new blend of fully fermented, organic plant-based superfoods that boost bioavailable nutrients and increase digestion while feeding your gut microbiome with a special blend of prebiotic fibre that won’t make you bloat! You can learn more about it here. 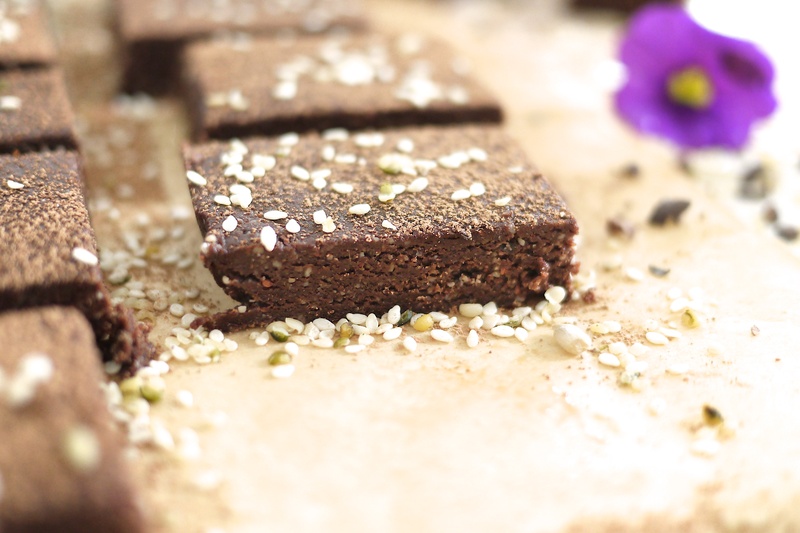 There’s all sorts of cacao in this recipe including raw cacao powder and cacao nibs as an option. Using raw cacao instead of cocoa powder means all those powerful antioxidants are still intact to work their free-radical fighting magic. 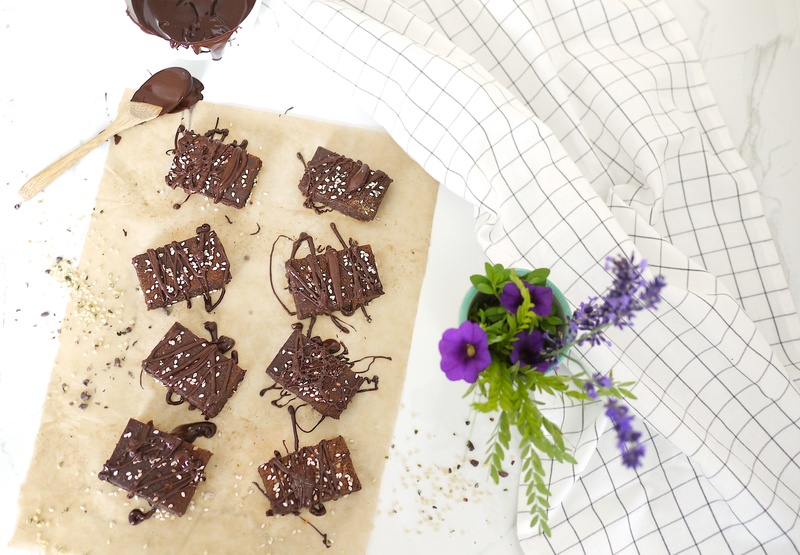 If you feel like adding a bit of sexiness to these delicious treats, try a drizzle of melted chocolate. In food processor, pulse together sunflower seeds until finely ground. Add hemp seeds and sesame seeds and pulse a few times until well combined. Add cacao powder, gut superfoods powder, sea salt and pulse until well combined. Add cacao nibs, vanilla and coconut oil and pulse until well combined. 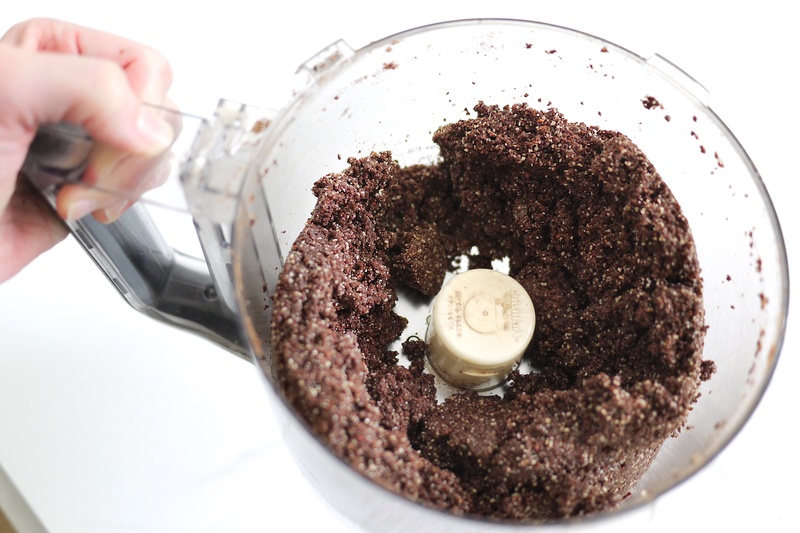 Add pitted dates one at a time while continuing to blend until well combined, sticky and starting to clump together a bit. 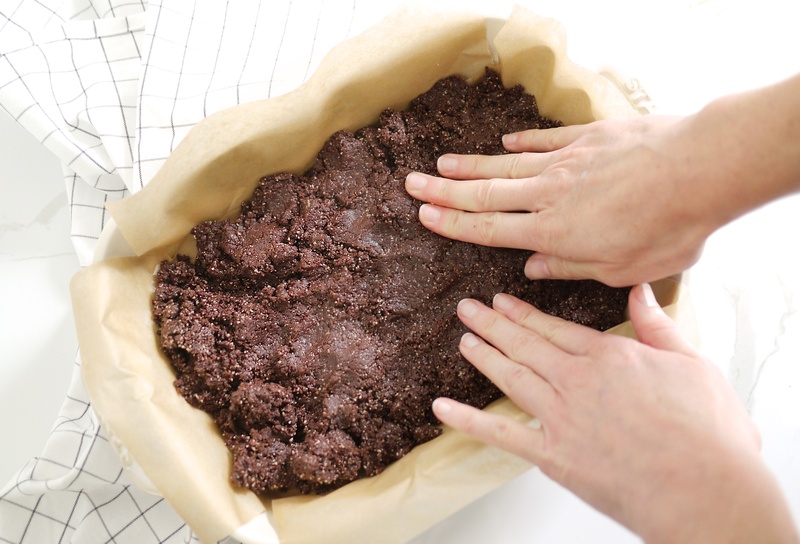 Scoop brownie mixture into a parchment-lined square or rectangle cake or casserole dish and press down firmly with fingers until evenly spread, flat and firm (you can sprinkle on few more seeds and cacao nibs before you do this to make ‘em prettier). Optional Step: Melt dark chocolate chips for additional topping.To melt chocolate chips, either use a double boiler or a heatproof dish that fits snugly onto a saucepan. Bring about 1 inch of water to a gentle boil in a saucepan. Meanwhile, add dark chocolate chips to your heatproof bowl (glass or ceramic). Place bowl of chocolate chips on top of saucepan with simmering water (the water should NOT touch the bottom of your heat-proof bowl). Gently stir until chocolate chips are melted. Remove bowl from heat before the last few bits have melted and reserve for drizzling over pan of pressed brownie mixture. Transfer dish to freezer for 15-20 minutes before slicing into small squares or rectangles. Store in an airtight container in the fridge or freezer and enjoy when feeling in the mode for a chocolaty treat. I hope you try this recipe out and like it as much as I do. If you do (and happen to snap a pic) be sure to tag me @kimdeoncom in your posts! 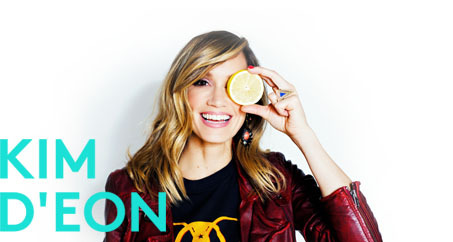 This post was created in partnership with Genuine Health, a brand I use and love. I take my recommendations seriously and am proud to be an ambassador for a great Canadian company that helps promote health and wellbeing. If you’d like to find out where to get some of their supplements, click here.